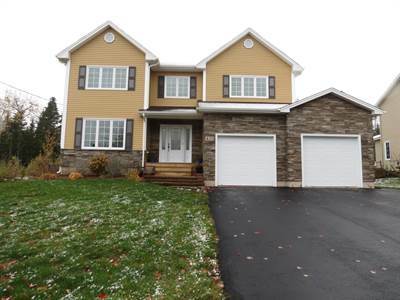 FANTASTIC 4 BEDROOM FAMILY HOME ON CUL-DE-SAC IN DIEPPE! • 2054 sqft , 3 bath , 1 half bath , 4 bdrm 2 story “With completely finished basement” – FOR SALE CAD399,900 . AMAZING 4 BEDROOM FAMILY HOME HAS GREAT FLOOR PLAN AND COMPLETELY FINISHED BASEMENT! This beautiful home is located in the heart of Dieppe close to all amenities and on a quiet cul-de-sac. The home sits on a beautifully landscaped and fenced yard. The main floor has spacious foyer, living room with natural gas fireplace and open to dining room. The kitchen has dark stained cabinets, granite counters with beautiful backsplash and island. The mudroom is just off the garage as is the half bath and laundry room. The 2nd floor has large master bedroom with 5pc ensuite which includes double sinks, jetted tub and separate 4ft shower, and walk-in-closet. There are 2 other spacious bedrooms each having their own walk-in closet. There is also a 4pc bath to complete this floor. The basement is also completely finished with family room 4th bedroom, 4pc bathroom and office. The attached garage features 2 separate doors for 2 vehicles to fit comfortably. Lots of extra features in this home: A/C, natural gas furnace with air cleaner, natural gas hook-ups for kitchen stove, dryer, fireplace, hot water heater, BBQ, central vac, lots and lots of closets for storage, decorative columns, crown moulding throughout, and more. Lots of windows and natural light also. This house is sure to please any growing family! Call today for your private tour! 3 BEDROOMS + 2 BATHROOM AND 2.6 ACRES! • 1152 sqft , 2 bath , 3 bdrm manufactured home – FOR SALE CAD97,900 . 2 bedrooms and a 4pc bath on one end and the master with 4pc Ensuite including a corner jacuzzi tub on the other end. painted. In 2016 a new cement slab was poured under the mini-home and insulation added to protect plumbing pipes. Bigger than it looks family home! 3 bedrooms, 3 bathrooms!!!! • 3229 sqft , 3 bath , 3 bdrm single story – FOR SALE CAD224,900 . LARGER THAN IT APPEARS! YOU MUST SEE ITTO APPRECIATE IT! This lovely family home displays pride of ownership. Only one owner and it’s the first time on the market. 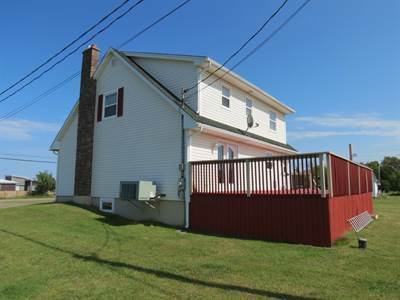 Sitting in the heart of Bouctouche, this home is surrounded by beautiful landcaped yard and fence. It is located within walking distance to both the elementary and high schools and across the street is the beautiful JK Irving Center. 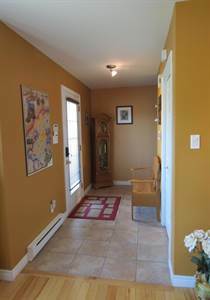 As you enter this home you will enter the large foyer with open staircase to the basement. The large living room has a cozy wood burning fireplace and open to the dining room. On the other side you will find a large kitchen, ideal for the ones who like to cook with ample counter space and tons of cabinets for all your storage needs. Also on the main floor, you will find a large and airy master bedroom with 4pc ensuite, down the hall is the main bathroom, 2 other good size bedrooms and another full bathroom. A bright sunroom for you to relax and unwind and a screened porch, ideal for the BBQ and enjoying the outside. The basement features 2 extra bedrooms (non-egress), Family room with billiard table, laundry room and unfinished utility-storage room. There is also an attached single car garage with staircase accessing the basement. Flooring consists of hardwood, ceramic and some laminate. Heating is oil and baseboard electric. Quick closing available. You must see this one! Call your REALTOR® for your personal tour! GREAT HOME FOR YOUR HOME BUSINESS! • 2880 sqft , 1 bath , 1 half bath , 4 bdrm 1 1/2 story – FOR SALE CAD279,900 . 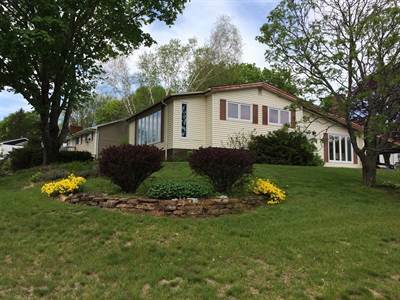 Welcome to this fully renovated beautiful Cape Cod with an amazing Water View of Northumberland Straight! This property sits on 1.45 Acres of land and has endless possibilities for the business owner! As you enter the home, to your left is a Bedroom/Office which was used as a Hair Salon in the past. It has a 2 pc bath and plumbing is there for a possible salon in the future (esthetician, nails, hair, etc.) Or, if you work from home, this office is perfect for you! 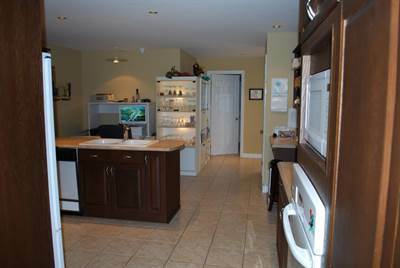 The main level also has an amazingly large updated kitchen which has access to the patio – perfect for barbecuing! You also have access to the patio from the extra large dining room which is perfect for entertaining. You will enjoy having your coffee in the large living room overlooking the bay. Upstairs you will find the large master bedroom with walk-in closet and 2 other good sized bedrooms. The bathroom is also completely renovated with a large tiled shower. The basement has a large living room, office and large storage room where the forced air heat pump is situated. There is a cold room off the storage room. Next to the storage room, you will find a large laundry room with a counter and storage space. There is a large detached garage in the backyard with attached workshop. The property has 3 phase power so if you own a business that needs more power (welder, mechanic, etc) this property is ready for you! It has driveways on both sides of the house – one going directly to the garage. • 624 sqft , 1 bath , 2 bdrm single story – FOR SALE CAD108,900 . • 1297 sqft , 1 bath , 3 bdrm manufactured home – FOR SALE CAD115,000 . 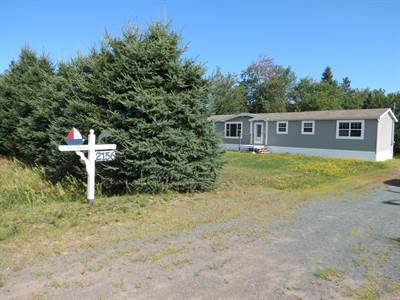 First Time Home Buyers wanting to live in Bouctouche – you have to check this one out! Very well maintained, this large RENOVATED mini-home is so well decorated, has many updates and add-ons! 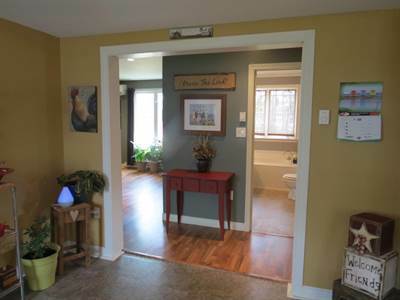 When you enter, you will love the LARGE entrance which is rarely seen in a minihome! You have a very spacious kitchen with an island, lots of cabinets and beautiful back splash. A very large dining room was added in 2008, perfect for your family diners! You will then see the spacious living room with access to the patio. The 4 piece bathroom has a stand-up shower and Jacuzzi. The Master Bedroom is very large with double closets. These 3 rooms were all added in 2008. The rest of the mini-home (original rooms) are 2 bedrooms and a spacious laundry room. One of the bedrooms is presently used as a den. You will love the updates in these rooms, including shiplap natural wood walls. The backyard is very private and the deck is amazing with lots of trees surrounding it. Roof, windows,Electrical (200 amp), Plumbing and Siding were all done around 2008-2009. It also has a mini-split. Walking distance to Les Petits Mollusques Daycare, a Skate Park and minutes from both Marguerite Michaud and Clement Cormier Schools – Perfect place to raise your family! Land is OWNED so no monthly fees!!! A must-see! Call your REALTOR® for a private visit! • 1477 sqft , 1 bath , 1 half bath , 2 bdrm 3-level split – FOR SALE CAD174,900 . A UNIQUE GEM! 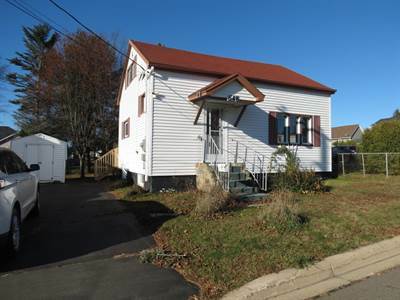 Welcome to 270 Beaubassin Ave., a corner lot! As you arrive, you will see pride of ownership at its best! Landscaped with beautiful flowers & trees, you will enter through the carport which has removable screened panels to enjoy as a gazebo where you can BBQ and entertain during the warmer months! There is also a storage room in the carport. You will enter the home through the very large eat-in kitchen which has professionally painted cabinets and lots of them! The large living room with a propane fireplace is parallel to the kitchen. Up a few stairs from the kitchen, you will find a large master bedroom (which used to be 2 bedrooms and could be easily re-converted). This large bedroom has one side used as a bedroom and the other side as a den. From there, you have access to the beautiful & quiet year round sun room where you will enjoy looking at the beautiful trees and flowers. You have a 2nd bedroom and 4 pc updated bathroom that completes this level. In the basement, there is a large and comfy living room with an electrical fireplace. It has an attached office, hobby room or simply an extension to your living room. There is also a laundry room which has a stand-up shower and sink along with the washer and dryer. A separate room next to it has the toilet. From the basement, you have a door going to the large crawlspace. The backyard is private where you can sit and enjoy the shade in the afternoon. This is a one of a kind home ! • 1787 sqft , 2 bath , 3 bdrm 2 story – FOR SALE CAD188,900 . 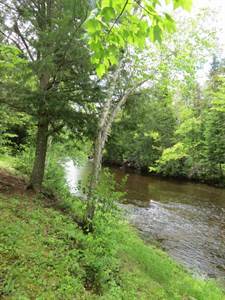 If you are looking for a Waterfront Home in the country, this is it!Welcome to this BEAUTIFUL WATERFRONT property next to the Chockpish River. 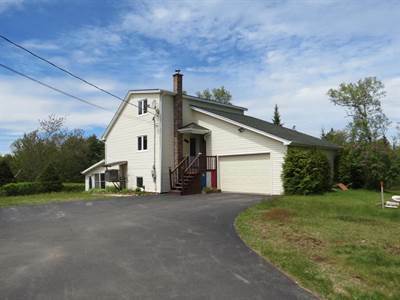 This 3 bedroom house sits on 1.96 acres of land with a long driveway and lots of trees for added privacy. Its breathtaking view of the river will take your breath away. On the main level you will find the kitchen which has brand new beautiful counter tops, a large dining area, living room/sun room with skylights and large windows that give you a beautiful river view and lots of sunshine. You have your immense master bedroom with 3pc bath/ensuite. You have the view of the river from the Master. On the 2nd floor, you have 2 good size bedrooms (one with a view of the river) and a nice little corner office/reading nook or play area for your children. On the lower level you will find a large family room, office (office has a separate storage room), full bathroom and laundry room. You will love the gorgeous walk out 3 season sun room where you can entertain and bbq! Attached to the sunroom is another storage room. The house has been freshly painted and has new light fixtures. The forced air heat pump is approximately 2 and a half years old. A single attached garage, paved driveway and well landscape area around the house finishes this amazing property. ONLY 5 kms to the Beautiful Beaches of the Irving Sand Dunes and minutes away from the beautiful beaches of Cote Ste-Anne! Book your showing today! • 1424 sqft , 1 bath , 1 half bath , 3 bdrm single story – FOR SALE CAD165,900 . This beautiful & updated semi-detached on quiet 21 Beaujolais Crescent will not last long! Owners just added a 3 season sunroom off the dining area to enjoy the quiet, treed backyard which offers privacy that you don’t find often in Dieppe! This home is in immaculate condition, pride of ownership at its best! It has 3 Mini splits, one on each level so that you can control the heat or air condition to your comfort wherever you are in the house! Beautiful curb appeal, landscaped and has a baby barn. Inside, you will find a spacious living room open to dining area with access to kitchen with all appliances remaining. You will fall in love with the new 3 season sunroom off the dining area. Perfect for entertaining or quiet nights overlooking the trees in your private backyard. The half bath finishes the main floor. Upstairs, you will find a large master bedroom with walk-in closet and access to the 4 piece bathroom. 2 other good size bedrooms complete this floor. The basement offers a recently finished large family room. It also offers a very large storage area with laundry area. Beaujolais Crescent is a very quiet and friendly area. Close to shopping, great schools, golf, restaurants and lots more. Don’t miss out – call for your private viewing today!